What was it like to be back on the new Flash series after a while, since Jay’s been absent since last season? It’s a very exciting episode. I completely understood the need for them to pare it back to the core cast, because we got pretty spun out in the third season with 21 Earths and overlapping timelines. I knew at the end of the season. I said “my guess would be they’re going to pare it back,” and they did that, down to the core cast, to remind us that this is about Barry, and Barry and Iris. 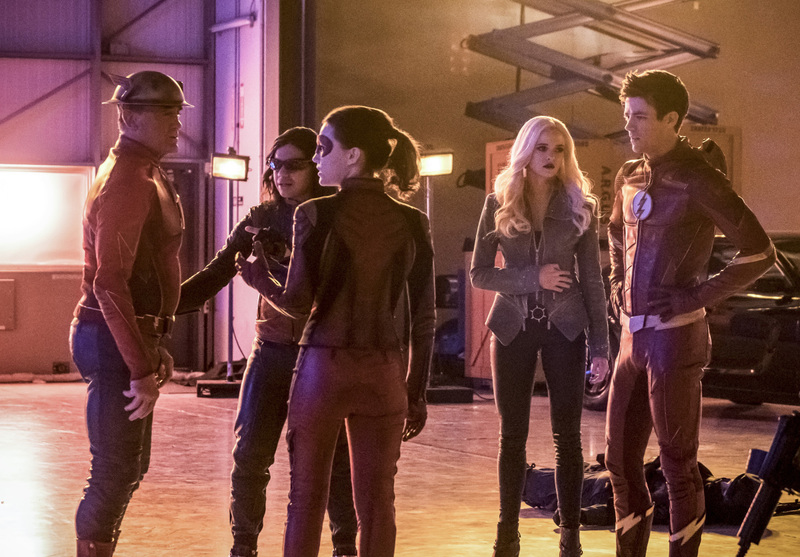 What that has set up is a great deal of excitement and anticipation about what will be, really, the first big speedster episode of the season. It’s great to come back on the tide of that excitement. I’m reading on Twitter, I’m reading on social media… people are so stoked for this episode, and they have good reason to be. I think it’s a brilliant concept. I think Todd Helbing and Sterling Gates added so much, and the whole concept of being in Flashtime and having a limited amount of physical resources and time in which to solve this problem before all Hell breaks loose… I just think it’s a great way to get us all in there working together. Is it true that you try to portray your Jay like your classic Barry Allen a bit? My Barry was a bit edgier, which surprised me when I went back to watch the episodes. In some instances, a bit cockier than Grant’s was at the beginning, although his Flash has the luxury of evolving over several seasons. Has Jay ever seen anything like the bus metas or the Thinker on his world? Well, the Thinker was a Jay Garrick villain [in the comics!] They pulled him into Earth One. I don’t know what really is going on on Earth Three, and that’s something I totally would be open to exploring, if they ever want to explore it. Where’s Joan Garrick? Where’s their French bulldog? But that’s just me. 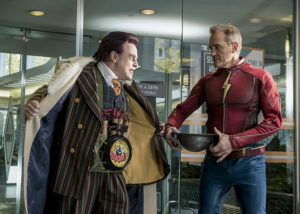 The series isn’t called “Jay Garrick.” The series is called “The Flash,” and The Flash is Grant Gustin’s Barry Allen, so I’m grateful for whatever character development we get with Jay. The real question is, would Joan Garrick look like Tina McGee? I don’t know! It’s possible. 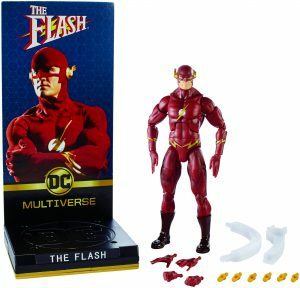 I saw that they made an action figure of your version of The Flash. Have you gotten one yet? I have not, but it blows my mind! Just yesterday I saw that somebody did a video of it, reviewing it, and it’s got some really cool features and ball joints, and things that move. I was watching it with someone who collects action figures, and they were like “man! They really went high end with this one.” It’s got some new features on it… I’ve gotta tell ya, it’s a little strange… they got the likeness really well. They did a really good job. I haven’t gotten one yet, but you can bet I will get one. I’ll put it with my Emmys! I’ll have my SOVAS Award… we just won a Society of Vocal Arts and Sciences award for Powder Burns, the audio Western that I’ve been doing for the last couple years… so I’ve got those awards on a table. I’ll put my little action figure beside them. What do you have to say to your fans of The Flash or people who knew you from soaps and other projects who have followed you for so many years? Just extreme gratitude. I see it every time I go to these conventions. One thing I always say, particularly to the comic book audience, is that The Flash was 50 years old when I got to it. It had been around for 50 years in 1990. And it’ll be going on after me, and after I and Grant and Ezra are gone. I’m just grateful to be able to take this journey with this wonderful world of fans of this pop cultural art form during this period of time. 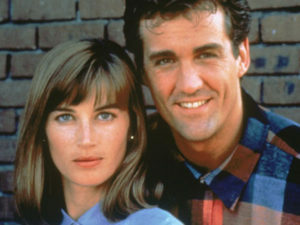 Having done soaps and having been in the comic book world, there’s a great deal of similarity between the two fan bases. They both know the lineage, they know the legacy, they know the characters, and they don’t want to be screwed with. And that kind of energy and excitement — it’s really special. I just could not be more grateful or more mindful of my good fortune. 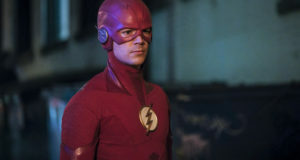 The Flash “Enter Flashtime” airs tonight (March 6) at 8PM ET/PT on The CW. Take a look at some photos below! 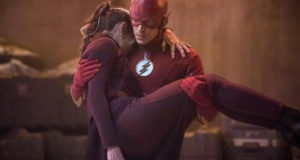 Previous: The Flash “Run, Iris, Run” Photos Are Here!